What are 11 most religious states in America? To make this list, first we have to see how do we rank religiosity. In studies about the most and the least religious states, people are usually asked if they attend religious services and if they do, how often. While the truthfulness of their answers may be disputed, it is one of the few indicators allowing us to determine how religious a particular group is. Before we present our list of 11 most religious states of America, we will compare some trends in religion changes in America and around the globe. The number of America’s citizens who identify themselves as unaffiliated (do not identify with any religion, agnostics, and atheists) is growing (in numbers: from 16.1% in 2007 to 22.8% in 2014). The number of Christians is declining, mainly among Catholics and Protestants, which are the two largest Christian denominations in the country. 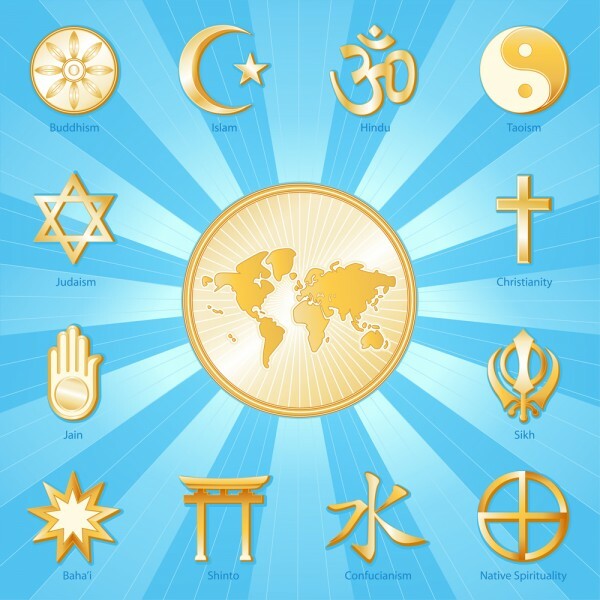 The Pew Research Center conducted this research in 2014 when around 35 000 Americans from all states was interviewed about their religious beliefs and affiliations. According to 2007 and 2014 Religious Landscape Study, the percentage of Christians has dropped from 78.4% in 2007 to 70.6 % in 2014. The biggest religion group in America are still Christians, with 70.6 %. Non-Christian groups (Jewish, Muslim, Buddhist, Hindu) account for 5.9%, other faiths – 1.5% and unaffiliated 22%. The percentage of Muslims grew from 0.4% in 2007 to 0.5% in 2014. The studies show that Islam is the fastest growing religious group in America. The trend is the same as in other parts of the world. Islam is the fastest growing religion in the world and the predictions are that the number Muslims will be the same as the number of Christians by 2050. Contrary to the mentioned trend in America, the number of unaffiliated in the world will be reduced by approximately 10% in the next four decades. The studies show that a large number of Christians switch to other religion or often to unaffiliated. It is projected that around 100 million Christian will leave their religion and become atheist, agnostic or unaffiliated. To rank religiosity state by state, we used another research conducted by Gallup (Gallup Daily Tracking), where they interviewed around 177,000 American citizens. This research was conducted from January to December 2014 and according to this research most of the 11 most religious states in America are in the South. The most religious state is Utah (attendance 51%) and the least religious state is Vermont (attendance 17%) according to Gallup Daily Tracking. Some of the 10 most religious cities in America are in these states. To make our list of 11 most religious states in America and in order to obtain more precise data, we used two sources. We combined data about attendance at religious services from both above-mentioned studies and compared them. Next to the name of each state, you will find the numbers which show data about weekly attendance at religious services. 10 most religious cities in America agnostic Alabama Arkansas atheist attendance at religious services Christians in America declining number of christians in america Do you attend religious service? Gallup Daily Tracking Georgia Hindu How often do you attend church? How often do you attend religious services? Jewish Kentucky List XFinance Louisiana Mississipi Mormon population Mormons muslim North Carolina Oklahoma Pew Research Center religion in America religiosity Religious Landscape Study Slideshow South Carolina Tennessee Texas unaffiliated Utah What are 11 most religious states in America?